Your students are changing. Technology is changing. The idea of the classroom is changing. Now, the way your students learn French is changing as well! In preparation for this edition of Deux mondes, we conducted extensive research, employing a wide array of research tools including surveys, focus groups, and ethnographic studies to identify the key goals and challenges of the Introductory French course. Not surprisingly, communication and cultural competence are top goals of the majority of instructors, while they are simultaneously faced with the challenges of fewer contact hours, budget cuts, and new course formats. Deux mondes, 7th edition, continues to offer a truly communicative approach that supports functional proficiency while responding to these changing needs in new and exciting ways. As a direct result of our research, we created Connect French (www.mhconnectfrench.com), a powerful online learning platform that includes the ebook, the online Cahier d'exercices, an audio/video chat tool, and a brand-new video filmed in Provence. *Connect French, including but not limited to the workbook/lab manual, the video program, and chat tools, is sold separately and does not come automatically with the purchase of the textbook. Updated cultural readings called À propos… develop such themes as French and Francophone geography, history, and society and present various perspectives on the cultures of the French-speaking world. Les Francophone sur le vif text readings and related documentary-style video segments feature real French people, not actors, who are of different ages and backgrounds. In the video interviews, they use authentic language to talk about who they are and what they do, in settings and situations that match the chapter themes. The Pour résumer activities (À vous de parler, À vous de lire, and À vous d'écrire) allows students to synthesize their knowledge and demonstrate their ability to use the chapter vocabulary and grammar communicatively. Grammar Tutorial videos, taught by an animated instructor, focus on 17 key structure points that students typically struggle with in the Introductory French course. Each tutorial is followed by a brief assessment to check for student learning and understanding. An interactive ebook, the complete Workbook/Lab Manual, grammar tutorials, and all the audio and video materials. LearnSmart, the only super-adaptive learning tool on the market, is proven to significantly enhance students’ learning and improve course outcomes. Available within Connect Spanish and as a mobile app, LearnSmart provides students with targeted feedback specific to their individual performance, and additional practice in areas where students need help the most. Additional interactive activities using drag-and-drop functionality, embedded audio, voice recorders, and videos targeting key vocabulary, grammar, and cultural content for extra practice. A comprehensive gradebook to view your assignment results. Voice Board and Blackboard IM, two powerful tools integrated into Connect Spanish, promote communication and collaboration outside the classroom. The 7th edition of Deux mondes continues to offer a truly communicative approach that supports functional proficiency while responding to the changing needs of the language classroom. 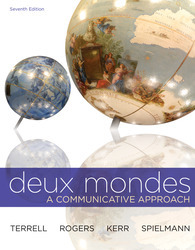 Deux mondes emphasizes communication in meaningful contexts in the target language. Throughout the program, students listen to and read comprehensible French and have ample opportunities to use French in autograph, interview, information gap, role-play, writing, and other personalized activities that are theme-based, not grammar-driven. In addition, the Dans le monde francophone activities in the text, many of which are based on authentic materials, offer communicative practice. Chapter themes and activities encourage students to link their study of French with their personal lives and other subjects they are studying. Grammaire et exercices section of each chapter takes grammar instruction out of the chapter progression so students can focus on using the language, not learning grammar rules. Chapitre 8 Parlons de la Terre! Tracy D. Terrell (late) received his Ph.D. in Spanish Linguistics from the University of Texas at Austin and published extensively in the area of Spanish dialectology. Professor Terrell’s publications on second-language acquisition are widely known in the United States and abroad. Mary Bassett Rogers holds her undergraduate and graduate degrees in French from Vanderbilt University. She taught French at Wichita State University for many years, where she became coordinator for foreign language education and supervised teaching assistants. She served as president of the Kansas Foreign Language Association and was a certified tester for the ACTFL Oral Proficiency Interview for several years. She has given numerous presentations and workshops on second language teaching and has also taught French and second language pedagogy at Friends University (Kansas). Professor Rogers is co-author of ¡Bravo!, a Natural Approach program for teaching Spanish in secondary and middle schools. Betsy J. Kerr is an Associate Professor of French at the University of Minnesota, Minneapolis. She received her Ph.D. in French linguistics from Indiana University and has published in the areas of French syntax and pragmatics, specializing in the analysis of spoken French discourse. At the University of Minnesota, Professor Kerr (formerly Barnes) teaches courses in French language and linguistics. She also serves as advisor to the director of the Lower Division French Program, a position she has held for many years. Born and raised in Marseille, Guy Spielmann (Ph.D., Vanderbilt University) is Associate Professor of French at Georgetown University. He was also Associate Director, then Director of the French School, Middlebury College. He has done research, lectured, and published extensively on second language acquisition and performing arts in Early Modern Europe. He has also pioneered work in the scholarly and pedagogical use of information technology. Visit La Page de Guy at www.georgetown.edu/spielmann.